SETH’S PICK :: SHAOLIN COWBOY #1: On the surface, Shaolin Cowboy might seem an uncommon staff pick from the likes of me. There’s not much depth by way of story, its violence is downright gratuitous, and character development is eschewed for visual antics. Yet, I find myself frequently including this book among my favorites. 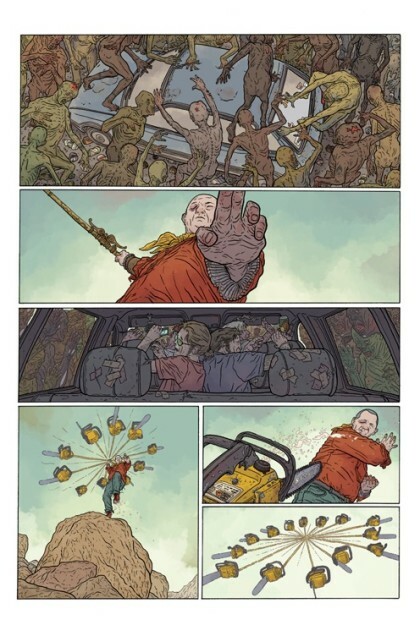 Geof Darrow is undoubtedly a master of the form, capable of drawing expansive single paneled pages and highly detailed action scenes with multiple characters. That’s undeniable, but is really just a part of why I love this book. Darrow imbues each page with joyous energy. Even if it’s a bloody scene, Darrow seems to relish the opportunity to put his silent protagonist through the ringer, confident that somehow they’ll both live to see the tale’s end. As a result, the book feels like Darrow is drawing exactly what he wants, giddily following his muse wherever it may lead. In this way, Shaolin Cowboy feels like the work of a seasoned jazz improviser soloing at the front of the stage. But like any experienced jazz musician, you know Darrow laid the groundwork for his solo with years of practice and discipline. This is the kind of book that makes me happy to have the opportunity to write about comics for this blog.